Claritin Changes Costly For Consumers? With the FDA's approval of Claritin as an over-the-counter drug, the popular allergy medicine may be in stores soon. The Early Show medical correspondent Dr. Emily Senay explained on Monday that the FDA news will lead to some changes in public-health practices and patients' pocketbooks. Analysts expect Claritin to go on sale over the counter within days. Schering-Plough's patent on loratadine, the active ingredient in Claritin, expires on Dec. 19. The drug's manufacturer said Claritin would be available in five different forms. Cost is a huge issue, considering the advent of generics and the fact that consumer-based companies like Wyeth and Johnson & Johnson are developing their own version of the widely used allergy drug. However, some experts think Claritin's branding will help the product lead its generic competitors in sales. The decision comes four years after a prominent insurance company petitioned the Food and Drug Administration to force Claritin's maker to sell it without a prescription here, just as has been the case for a long time in Canada. 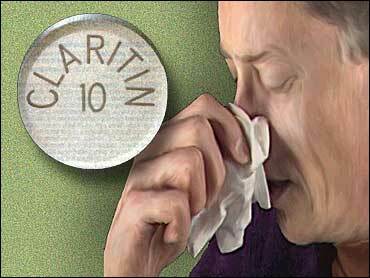 Claritin is a "non-sedating" alternative to seasonal allergy drugs, such as Benadryl, which already is available over the counter. Insurance companies hope FDA over-the-counter approval will help cut rising prescription drug costs before employers stop offering drug coverage. California-based Wellpoint Healthcare Networks, the nation's fourth-largest health plan, with 13 million members, estimates the change could cut by 5 percent to 7 percent the nation's surging bill for prescription medicines, now at more than $154 billion. However, the public may not reap savings. Insurance companies may no longer pay for Claritin, meaning less affluent people who do have health insurance may not be able to afford the drug when they have to pay for it themselves. The same companies may also increase the co-payment for Claritin's rivals, such as Allegra and Zyrtec, causing patients to make health decisions based on which drug is cheaper instead of which works best for an individual. The over-the-counter status of Claritin also may cause people with allergies to skip a doctor's visit for a proper examination of their symptoms. Claritin proved a bonanza for Schering-Plough, with sales in the U.S. last year reaching $2.8 billion, or about 28 percent of total sales of $9.8 billion. But the company expects profits next year to fall as much as 35 percent because of lower revenue from Claritin. Worldwide sales of Claritin last year were $3.1 billion.